The U.S. Senate race between Republican challenger Thom Tillis and Democratic incumbent Kay Hagan seems to be taking a notable shift in tone and approach, seemingly driven by gender. Never mind that the race is between a man and a woman; the issues, ads, and even the polling have become representative of the classic ‘gender gap’ that surfaces within American politics. From the first debate’s tussle between Hagan and Tillis over the issue of the challenger calling the incumbent “Kay” to the charges of “mansplaining” over math, the campaign’s dynamics seems to have become much more pronounced over gender issues and perceptions. Tillis sought to put Hagan on the defensive by advocating for over-the-counter contraceptives during their first debate, while Hagan’s campaign has made effective narrative use of women in recent advertisements against Tillis and the state legislature. In general, we tended to associate women as more Democratic in their voting, while men are generally more Republican. Polling in this race has shown this gender division, with Hagan typically pulling more women and Tillis pulling more support from men. Just recently, an Elon University Poll found that Hagan was pulling 52 percent of the female vote, while Tillis was pulling 50 percent of the male vote. Another poll by American Insights had Hagan winning both gender blocks, albeit by larger numbers among women (plus 13 percent, 44-31) than men (plus 4, or 41-37). 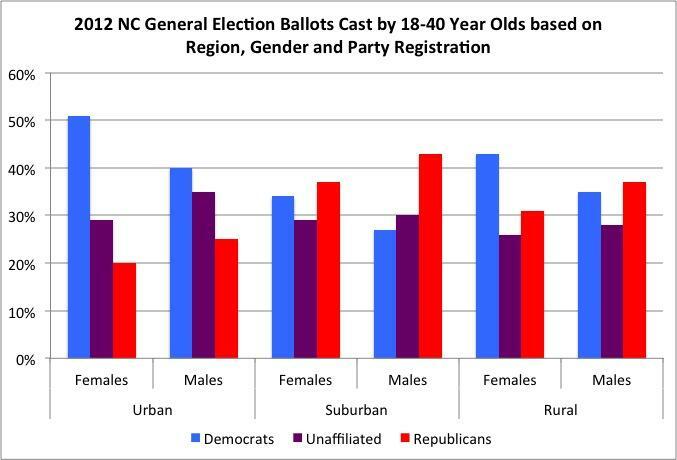 In North Carolina, women make up 54 percent of registered voters. In the 2012 general election, 48 percent were registered Democratic, 30 percent Republican, and 23 percent unaffiliated. In comparison, men are 40 percent registered Democratic, 34 percent Republican, and 26 percent unaffiliated. But these numbers need to be understood within the context of the changing dynamics of the state’s politics, most notably by age and by the urban-suburban-rural dynamics. In looking at 18 to 40-year-old voters in the 2012 general election, interesting patterns emerge that could cause future concern for Republicans in the state in presidential years. 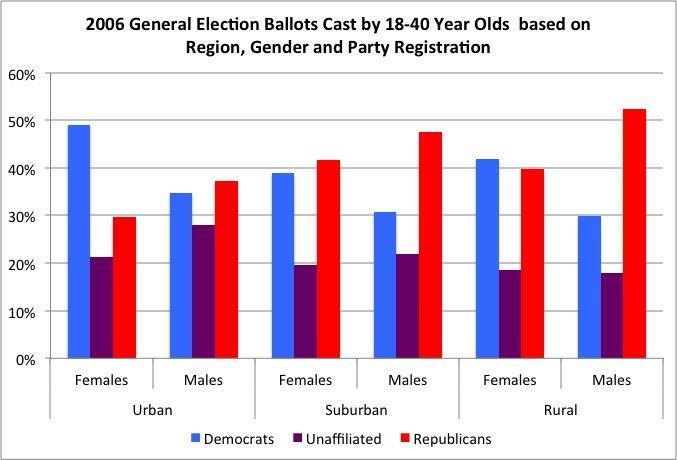 Within urban areas for voters under 40 years old, Republicans were a distant third among both women and men in party registration in 2012. Only 20 percent of urban women were registered to the GOP, while only a quarter of urban men were registered Republicans. Among suburban voters under 40, Republicans are a plurality of both female (37 percent) and male voters (43 percent), but go into the rural counties of the state, and the gender gap is pronounced there, with 43 percent of female voters under 40 registered Democrat while 37 percent of male voters under 40 are registered Republican. While these presidential year trends are notable, this year’s mid-term election poses advantages for Republicans. Besides an electorate that will be older, unaffiliated voters drop off the map when it comes to non-presidential elections, and Republicans make up for that slide with their presence, even in Democratic-leaning years. In 2006, a notable Democratic wave year, only urban and rural Democratic females constitute a plurality in those regions: the presence of unaffiliated voters plummeted across the board, allowing GOP presence to show significant growth. One other important aspect to this gender gap: the influence of the urban counties is significant in terms of voting patterns. Traditionally, 13 of North Carolina’s 100 counties deliver over 50 percent of the vote. That can only help Hagan’s campaign with the significant presence of female Democratic voters in those areas. In fact, she needs female voters across the state to turn out in numbers more akin to a presidential year than what happened in the best mid-term election year for Democrats. Perhaps the campaign strategy designed around gender issues is helping Hagan keep herself in a highly competitive finish.